As you have by now deduced, I have a strong streak of DIY in me, even if it does battle with my inherent and deep-rooted laziness. I love a project around the house. As long as I can complete it successfully before I get bored, and before it gets too hard. You can read more about this illness in this post. However, despite my skill at procrastination and my preference for watching police procedurals on television over doing actual work, I usually don’t shy away from things that will ultimately make my life easier, or my apartment more beautiful. I have successfully painted both the horrible circa 1976 linoleum flooring and vintage Formica counter in my bathroom. And yes, I know these are two surfaces not known for taking well to paint, however I am a person who does not take well to ugly, so I worked some polymathematical magic. I kitted out the guest room closet with a wall of built-in shelves all by my lonesome, can you say glorious shoe closet? Back in the day I could assemble any piece of IKEA or other boxed furniture in record time and without leftover bits and pieces. I am very grateful to not have to decorate with boxed furniture anymore, but I was always pretty proud of my skills in that arena. But when it comes to food and entertaining, I have always been pretty vocal about not feeling the need to do every single thing myself. I’m a fan of a potluck, letting my foodie pals show off their skills. And I’m not above calling out for pizza if things get tricky or something goes awry in my prep. A journalist once asked me in an interview if I thought of myself as a Martha Stewart type. I thought about this for a moment. On the one hand, I do subscribe to a lifestyle that includes making even the mundane as beautiful as possible, that honors guests in my home and seeks to make that experience as purely pleasurable as possible for them. I like collections of things, I like decorating, I love cooking. 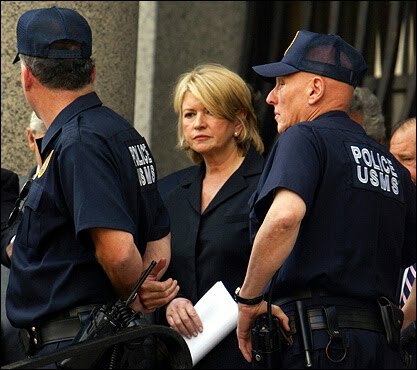 So Martha and I certainly have a lot of things in common. We also have a lot of things we do not share. I do not have a eleventy-gabillion dollar budget and a full time staff of minions doing my bidding and my gardening and creating the perfect shade of robin’s egg blue paint for that cast-off cabinet I am repurposing for the mudroom. I also do not have a mudroom. And weirdly, with her time in the slammer, she may have more street cred than I do. I appreciate her drive and ambition and the empire she has created for herself. I’m less impressed with the idea that one has to present their ideas as the “right” way to do something, as opposed to “one interesting” way to do something. While it makes for some hilarious television watching moments to see MS bring on an expert to show her something and then patronize them, and essentially fix what she believes wrong with their way of doing things. I’m sure that Voice Of God tone of authority isn’t purposely horribly condescending, but there is a sense that one gets from her “advice” that if you are stupid enough to do it another way, you will suffer the consequences of your actions. But one Polymath has to acknowledge another, and there is no doubt that for every thing I have ever seen from Martha that made me cringe, there is another idea I have embraced and appreciated. I eventually replied to the reporter that I do think of myself as a Martha Stewart type, just without the clenched perfectionism. I think you can have a wonderful dinner party without firing the dishes in the kiln out back and weaving your own napkins from wool you spun last night from your personal flock of monogrammed sheep. I actually think you can have a great dinner party on paper plates with takeout food, because at the end of the day, entertaining is ultimately about sharing time with the people you care about and everything else is gilding the lily. I have been vocal for years about things like not baking my own bread, not because I can’t, I certainly can….I am a Polymath after all…but because there are wonderful local bakeries who do it better and more deliciously, and I choose to put my energy elsewhere. I love to make desserts, but I don’t hesitate to pick one up somewhere if the flavor I want is better done by a professional. I don’t want to make my own puff pastry or phyllo dough. There is perfectly good frozen stuff available, and I’d rather focus on fillings. So it may come as something of a shock to discover that at the moment, I am making my own sparkling water and pop. I’ve never been much of a pop drinker. I have always hated most diet versions of things, I especially think Diet Coke tastes strongly of old socks. I hate the tinny flavor of most artificial sweeteners, and the lingering aftertaste. I do find that Diet Barq’s root beer and Fresca avoid this, so those are my go-to choices. I love real classic Coke, preferably icy cold in the small 8 oz glass bottles, but more as a treat than as a beverage. I love a good ginger ale, but again, the real stuff not diet, and I cannot justify the amount of sugar in non-diet drinks, so I limit myself to an occasional treat. On a daily basis, I’m more of a plain water (tap, mineral, sparkling, still) or tea (iced or hot) kind of girl. At least I was. 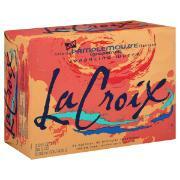 Until I found LaCroix Pamplemousse. It is important to know a few things about me. One, I think most sparkling flavored waters taste strongly of furniture polish. Two, pamplemousse is my favorite single word in French. It means grapefruit, which is one of my favorite flavors, but I think even if I didn’t like the flavor of grapefruit, I would still love the word. Just say it once, out loud. C’mon, no one is listening. Pamplemousse. Pronounced POM-PLA-MOOSE. Isn’t that fun? Don’t you want to say it again? I always thought if I ever had a restaurant I would name it Pamplemousse. Except your Polymath does not want to work that hard. Three, pamplemousse is also Charming Suitor’s favorite word in French, something we discovered early on in our courtship. He has spent years trying to get his friends to name their pets, and alternately children, Pamplemousse. He will occasionally look me in the eye and say “You had me at Pamplemousse.” which I am sure is making you throw up a little in your mouth right now, but it literally makes my heart melt every time. So when LaCroix came out with a grapefruit version of their flavored sparkling water and called it Pamplemousse, I had to try it. I don’t know if I love it because it actually is delicious, or because I was psychologically pre-disposed to like it based on the name, but the fact is that I now drink about two to three cases of it a week. CS loves it too, as do some of my closest friends, so I like to think it is really just tasty. Very lightly flavored, and oddly great with most food. No artificial colors or flavors or salt or sweetener, so it is good for my program. But it is also about $5 a case, and while it isn’t exactly a smoking habit, it isn’t cheap. And even though I recycle, the volume of cans is a little embarrassing. 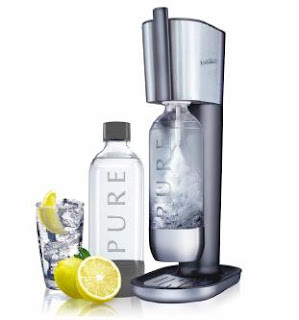 My dear friend, Brooklyn Harry, recently admitted that his new passion was making his own sparkling water and pop at home with a gadget called a Soda Stream . The last couple of times I visited with him, he made some for me, and it was really good. But then I got home and sort of forgot about it. Until they generously sent me one to try. First off, yes, it is one more appliance, and it only does one thing, so it breaks my Ruhlman rule of keeping it simple and trying not to clutter up the kitchen. On the other hand, it does that one thing so well, and it is getting so much use, I prefer to put it in the Rice Cooker category, as not clutter, but essential. For starters, it is dead easy. Five minutes after I opened the box, I was drinking a frosty glass of homemade soda water. No electricity, no batteries, so it can be anywhere. Pop in the canister, fill the special bottle with cold water, screw it into the machine, pull the lever three times and presto! Fizzy lifting drinks in your own home! They sent nearly a dozen flavors to try out, and the first one I tried was, of course, Diet Pink Grapefruit . It tastes very close to Fresca, but with the bonus of a lovely pink color. And while I do enjoy the flavor of the full strength, I quickly discovered that putting just a drop in the bottle, I can pretty well mimic my beloved Pamplemousse. They have a great ginger ale, which CS loved, and both regular and diet Tonic, so mixers for cocktail parties are well covered. You name your favorite pop, they have a version. There are 38 flavors all told, in regular and diet, with four ‘essences’ for unsweetened flavored water. Sadly, no grapefruit essence yet, but I’m hopeful! And an unexpected shocker, even the regular flavors are about a third the calories and carbs and sugars of the commercial brands, with half the caffeine and almost no sodium, so when I want to indulge, I’m not totally derailing my program. I wish I could say that I’m exclusively making my own carbonated beverages, saving money and not being part of the can culture, but I do have to be honest about my LaCroix consumption. Reduced, but not eliminated. Pamplemousse, I just can’t quit you! Regardless, it is fun to be able to offer guests their own custom fizzies when they arrive, I am glad not to have to keep tonic and soda slowly going flat in the pantry on the off chance someone wants a cocktail, and I am experimenting with making some of my own flavorings by adding in fresh pureed fruit, herbs, and other fun stuff. Cucumber mint is delish, ditto strawberry basil. The bottles of mix are only about $5,and make 12 liters, so it is very affordable, but you can also experiment with those wonderful French and Italian soda syrups, just add slowly to find the amounts that work for you. I think Martha would approve. Can I just mention that I love your use of the word 'pop' instead of 'soda'? Makes me feel right at home. Midwesterners represent! ditto the 'pop' reference. I have lived my whole life in NE IN (20 miles W of Fort Wayne) and my husband drives me NUTS with saying soda or coke. He lived in FL for 8 of his 48 yrs and he hopes to live til our 20th anniversary next month! My daughter has strayed from her raising to say soda or coke. Her online friends have her converted. Then there's the whole shopping basket/cart/buggy debate. ARRGH! I'm seeking an alternative to the embarrassing mounds of Pamplemousse cans I create daily... I really enjoyed your article! Still not sure about purchasing a SodaStream.